Our Peninsula Tour is perfect for riders who want to visit the heart of the Wild Atlantic Way. You’ll be on your bike every day, exploring the best that Ireland’s west coast has to offer! 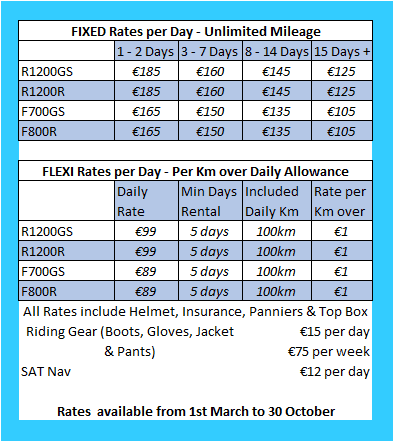 This package is an ideal option for riders travelling to Ireland Bike Fest, a fantastic annual bike festival right on our doorstep! We have selected riding routes with an emphasis on scenery and being off the beaten path. 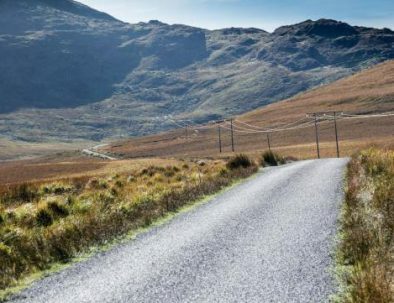 The 3 Peninsulas offer some of the best riding in the whole country, with famous routes including Ring of Kerry, Conor Pass and The Healey Pass – memories in the making. Each evening relax in the splendour of the luxurious 4 star hotel, The Brehon. Guided Option There is an option to make this tour guided. The Dingle Peninsula offers a great way to start exploring the 3 peninsulas. The riding is not technical and gives you a mice way to get accustomed to your bike and surroundings. This tour takes you west along the Dingle peninsula, heading towards the Atlantic Ocean. First, you skirt the lakes of Killarney to the north, before heading out into open countryside. Inch Beach – stop here to fill your lungs with the fresh air blowing in off the Atlantic. This beach is almost always windy, and is subject to Atlantic swell, which makes for great surf, so maybe you’ll be able to watch some surfers or kitesurfers pit themselves against the elements. There is a bar/café on the beach, if you want to stay a while. The Dingle peninsula has dozens of beaches, but this is arguably the biggest and most dramatic. Pass through Dingle town. You might like to stop here now, or later in the afternoon you will be coming back this way. It’s a pretty, colourful town with a range of souvenir and craft shops. If you want to experience local wildlife, there are regular boat trips (duration one hour) out into the harbour where you are guaranteed to meet Fungi, a tame dolphin who enjoys putting on aerobatic displays for the boats and has been on show for over 25 years. 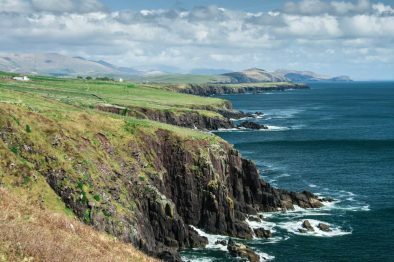 From here we take the Slea Head Drive, which brings you out in a loop around the tip of the Dingle Peninsula to look west out over the Atlantic and to visit some of Ireland’s most famous ancient monuments. Remember this view is what inspired St. Brendan the Navigator to set sail in the 5th century, when he went all the way to the New World. This is a world class driving route, as you hug the cliffs all the way around, with dramatic Atlantic views to your left and Kerry’s beautiful glaciated mountains to your right. If you are looking for somewhere unusual for lunch, we recommend The Stonehouse Restaurant – one of the most unique restaurants in the world, serving excellent bistro style food in a genuine Irish ‘Stone House’, the entire building is constructed in stone, in the time honoured tradition of the area. The Stone House Restaurant is right beside one of Ireland’s most famous prehistoric sites, Dún Beag Fort, which dates from the late Bronze Age (about 800BC) – you could take a look before getting back on the road. Keep an eye out for Clochans, or Bee Hive Huts: These are a very unusual dwelling, made entirely of dry stone with no mortar of any kind. This building technique was used here for milennia, with the oldest examples dating back to 3000BC. These huts can be seen from the road in Fahan, on the Slea Head Drive. They were part of a collection of about 400 that once covered the hillside. It is thought that they date from the 12th Century and were private dwellings, linked together with passageways. They are very similar to the Beehive Huts on the Skellig Islands, off the Ring of Kerry, which were part of an ancient monastic settlement. After Ballyferriter village, if you are interested in unusual architecture or ancient Irish history, stop off at Gallarus Oratory, an ancient chapel built using dry stone walling (no mortar of any kind). It looks like an upturned boat, and nobody knows exactly how old it is. A unique spot. Dingle Town – maybe a good time for a coffee before you climb the Conor Pass, or a taste of Murphy’s Ice Cream, an artisan ice cream maker located near the sea front who pride themselves on local, seasonal and unusual flavours. Dingle is also home to the Crean’s Brewery Visitor Centre, and the Dingle Distillery where whiskey and gin are made. Both offer tours, and a taster to take away with you for the end of the day. The Conor Pass – it’s time to climb Ireland’s highest mountain pass. This narrow, twisty road links Dingle town to the sandy shores of the north side of the peninsula, and it will take your breath away. Caherconree Pass – this is your first taste of Ireland’s back roads, where you leave the traffic behind and return through the mountains heading south towardst the green vale of You climb very close to the Caherconree Fort, an ancient stone fort, well worth a look if you are interested in ancient monuments. It is mentioned in some of Ireland’s oldest literature, as the site of a great battle, said to have been fought here in the 7th century. The Ring of Kerry – Your route starts out on the famous Ring of Kerry, which is a “must do” on every visitors list while in the South West of Ireland. 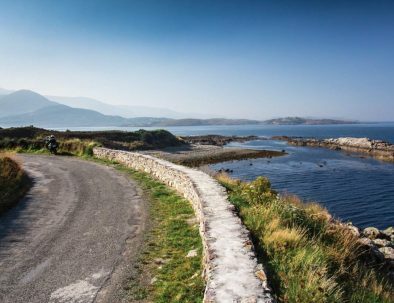 We ride the Ring in a clockwise direction so that you ride with the sea on your left and in the opposite direction of the coaches – it’s the perfect way to see the Ring of Kerry! Within minutes of leaving LemonRock, you will be riding in spectacular scenery, and Ladies View will be a must stop. Next you will ride along the famous Molls Gap – also renowned by car rally drivers as a spectacular section and equally exciting on a motorcycle! The Skellig Ring scenic drive starts in Waterville and takes in the wonderful Valentia Island accessed by bridge from the picturesque Portmagee and Ballinskelligs. Valentia Island – The Valentia Island Tetrapod Footprints are the most extensive of the four Devonian trackways in the world. Riding down the island you’ll reach Knightstown where you can take a short ferry ride to Reenard Point back onto the mainland – with options for excellent lunch breaks in either town. Cahirsiveen, Mountain Stage, Kells Bay, Glenbeigh – these are famous parts of The Ring of Kerry. You can switch off your intercoms and enjoy the spectacular views in silence! Killorglin – Home to the famous annual Puck Fair. Puck Fair, (‘poc’ being the Irish for a male goat) is one of Ireland’s oldest fairs. The “Queen of Puck”, traditionally a young school girl from one of the local primary schools, crowns the goat “King Puck“. It takes place each August 10th. The goat is released unharmed! Often regarded as the jewel in the crown of the 3 Peninsulas, it really is a magical ride! Taking the route to Kenmare, via Molls Gap and heading for Lauragh, you can stop off for a break at Teddie O’Sullivan’s or early lunch, where the local mussels are unquestionably unrivaled! You then can choose to ride over The Healey Pass, which is a great option, especially if the weather is fine. It’s quite technical with small roads and numerous switch backs. If time is with you, it’s worth riding it in both directions as the views are stunning and different from each direction. Ride out as far as Lamb’s Head and then back along the southern part of the Peninsula, when you are now in Co. Cork. Stop off in the fishing town of Castletown Bearhaven and ride towards Glengarriff. From here, you can take scenic boat rides out to Garnish Island, which is well worth a visit. Heading back to Killarney via the Caha Pass – also a wonderful riding route and time dependent via Black Valley or try the Kilgarvin route, which is a really nice riding road. Overnight in Killarney at The Brehon. Depending on time of flight, you may have time for shopping in Killarney or relaxing in the excellent Angsana Spa in the Brehon Hotel. Does this look like fun? Book your motorcycle tour today! Please confirm your agreement for Lemonrock to store these details for the purpose of responding to your inquiry. We may send you occasional emails, from which you can also unsubscribe. You may request at any time for us to delete your contact details from our system. We do not share your data with any third parties.